A considerable number of years ago I worked part-time as a Pampered Chef consultant. I loved that job! Talk about incentives – every month there was one, and let me tell you I loved them too. If you could sell Pampered Chef, you could earn free products. Let’s just put it this way, I earned so many free products I couldn’t carry all of them to my shows anymore. Today I still have, and treasure, all of my Pampered Chef products. And of course, I have favorites. One of my most favorites is a cookbook I earned. It’s called The Pampered Chef Celebrate! Family, Friends & Great Food. I always thought Pampered Chef’s concept where food preparation was concerned was to keep it easy, make it taste great. When I found a brownie mix on sale at Target this weekend for .65 cents, Tuxedo Brownies from this cookbook immediately came to mind. These are such cute little treats and have a great taste – you can’t go wrong. Because I was out of white baking chocolate I had to alter the recipe slightly. Preheat oven to 325 degrees. Spray mini-muffin pan with nonstick cooking spray. Prepare brownie mix (19-21 oz) according to package for cake-like brownies. Fill each cup 2/3 full. Bake for 14 minutes or until edges are set. Do not overbake. Remove pan from oven and set on cooling rack. Press tops in (making a small well). Cool for 15 minutes in pan and remove. Microwave 2 (1 oz) squares of white baking chocolate (I used 1 (1 oz square) of semi-sweet baking chocolate) and 2 tablespoons of milk (I used 1 tablespoon of milk) for 1 minute. Stir until smooth. Cool slightly. Mix 8 oz of softened cream cheese and 1/4 cup powdered sugar in separate bowl. Gradually stir in melted chocolate mixture. Fold in 1 cup of thawed whipped frozen topping. Fill pastry bag, or Easy Accent Decorator (star tip) and pipe into center of brownies. 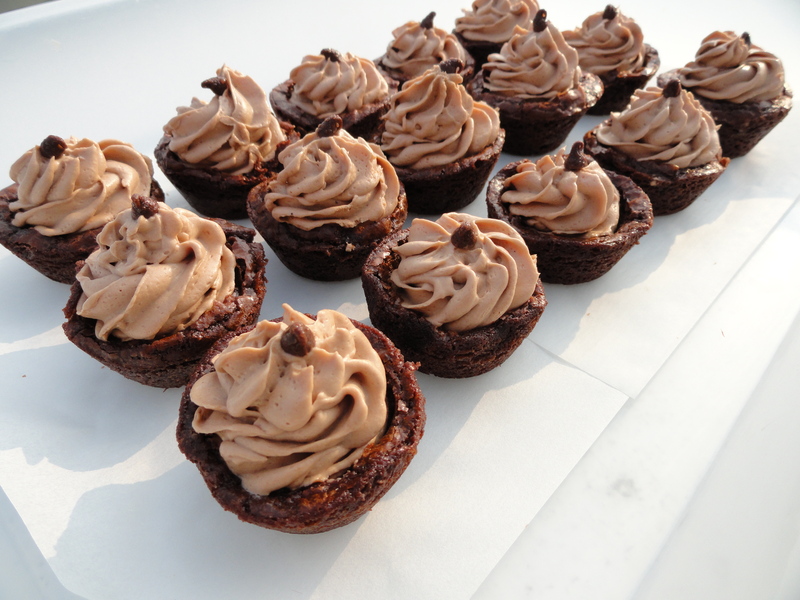 Garnish with mini – chocolate chips. Warning – Make sure you take a picture of them because they will go so fast that’s all you’ll have left to remember them by! omg these look so good–nice picture!! They look great to me! I’ve never tried this mix, but it sounds wonderful! Those cupcakes look SO good!!! I don’t have many Pampered Chef products, but the things I have, I absolutely love! Oh, these look so delicious and your photography is just spectacular. This should be in a cookbook. I am just wanting one right now. Wish I could reach through the screen. What a fun party food too. You got that right! It’s a great recipe – everyone thinks you worked so hard to make them but they really are so easy to make.